Leagues and competitions across Europe introduced video assistant referees in 2018 with varying degrees of success. It was a hit at the World Cup in Russia, earning rave reviews for its swift application. But there were exceptions. Here, theScore rates the most notable calls of the past year. England already had a bad impression of VAR before it wreaked havoc on Tottenham’s FA Cup replay against Rochdale. Pundits and fans had complained that VAR was killing momentum of the game, and criticism mounted when two of Tottenham’s goals were ruled out in the fifth-round fixture. Erik Lamela’s opener was disallowed for a questionable foul after a lengthy discussion between referee Paul Tierney and his assistant. It certainly wasn’t a “clear and obvious error,” which is the only thing VAR should consider when taking action. Heung-Min Son’s penalty was also canceled out after it was determined the South Korean had come to a complete stop. Fans at Wembley – who couldn’t see any replays on the big screen – grew impatient as the referee once again waited several minutes to make a decision. Tottenham still won the match 6-1, but the seeds of doubt were planted. The year’s most bizarre VAR incident occurred at halftime of last season’s match between relegation battlers Mainz and Freiburg. Referee Guido Winkmann had already sent the players to the dressing room when VAR alerted him to a potential handball during the final play of the half. After nearly five minutes of consultation and lots of confusion, Winkmann determined Freiburg’s Marc-Oliver Kempf had indeed handled the ball and called the players back to the pitch. Mainz scored the subsequent penalty and won the game 2-0. Even if the decision was correct, the situation was a farce. It shouldn’t have taken five minutes to learn that Kempf’s arm was in an unnatural position. The offence was clear. VAR was unanimously praised for denying Neymar a penalty that clearly wasn’t in the group stage of the World Cup. 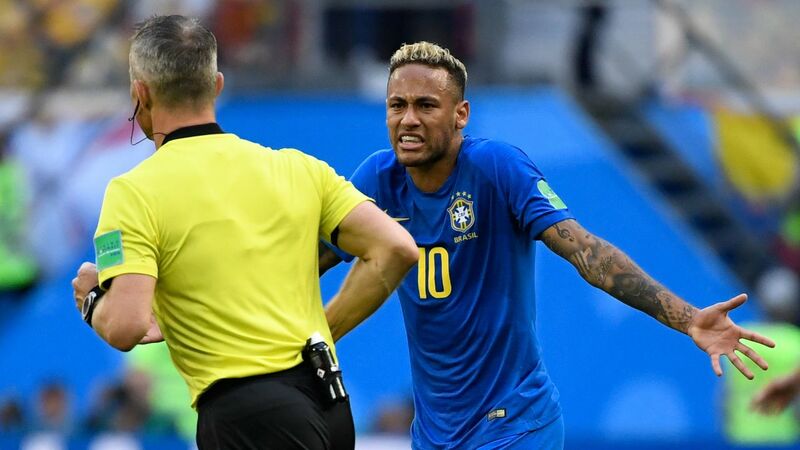 Referee Bjorn Kuipers was, at first, sold by Neymar’s pantomime, awarding a spot-kick to Brazil with the match still scoreless. Kuipers believed Costa Rica’s Giancarlo Gonzalez had tugged on Neymar’s jersey, but a review of the footage showed the 26-year-old had instead thrown himself to the ground. VAR stepped in to give Neymar a deserved yellow card. At the time, it was one of the biggest moments of the World Cup. Iago Aspas thought he’d scored a wonderful backheel goal in the 91st minute against Morocco – until the linesman ruled it offside. The goal was only awarded after a second opinion from VAR, which determined using calibrated lines that Morocco defender Mbark Boussoufa had played the Spanish substitute onside. The goal, coupled with Iran’s late equalizer in the coinciding Group B match against Portugal, put Spain into first place. Iran manager Carlos Queiroz couldn’t understand why Cristiano Ronaldo wasn’t sent off. Ronaldo appeared to elbow center-back Morteza Pouraliganji as they jockeyed for possession, prompting hysteria on Iran’s bench. Referee Enrique Caceres was called to review the footage and ultimately gave Ronaldo a yellow instead of the red Queiroz was looking for. It took several minutes before Caceres reached into his pocket. Ronaldo clearly swung his arm but only to get past Morteza Pouraliganji, who had stumbled into the path of the Portuguese international. According to FIFA rules, a player can be cautioned for a reckless offense and sent off for using excessive force. No one can dispute Ronaldo was reckless, but it’s debatable whether he used excessive force. Caceres had reasonable cause to show a yellow card. Two controversial calls in Wolfsburg’s 2-1 win over Schalke forced the Bundesliga to remove a veteran official from VAR duty. Wolfgang Stark, who has World Cup experience, interfered a little too much in the second half, changing the referee’s calls on two cardable offences. Schalke defender Matija Nastasic was initially awarded a yellow card for a high-footed challenge but was later sent off on Stark’s orders. Then, Wolfsburg striker Wout Weghorst’s red card for an unnecessary push on Schalke’s Guido Burgstaller was downgraded to a yellow. The referee’s initial calls weren’t exactly “clear and obvious errors,” meaning VAR wasn’t necessary in either case. The final decisions weren’t wrong, either, but the constant interference went against protocol. VAR stepped in to administer justice after Juventus winger Douglas Costa elbowed, headbutted, and spat at Sassuolo counterpart Federico Di Francesco. Referee Daniele Chiffi somehow believed Costa’s moment of madness deserved only a yellow card – which is a separate concern altogether – but VAR quickly changed that to a red. Costa would’ve been suspended regardless, but VAR made sure there were absolutely no doubts about what he’d done.